My portfolio fully recovered from December's decline in value. Dividends are higher so far this year. I provide an update for the first two months of 2019. What did I think at my last portfolio review? I have now written quite a few articles on my portfolio. I recently released a blog that contains background information on the portfolio as well as links to all the articles about it here. I have also published an article on my investment strategy here. As many people know, the stock market went down quite a bit right around Christmas last year. My portfolio was no exception; it dropped quite a bit and ended up down for the year, as you can see in the chart below. While I don’t focus much on portfolio value or total return, it wasn’t exactly a good feeling seeing my portfolio down to $511,421. That was around $20,000 below where it started the year. All data presented in this article comes either from my broker or from this tool. It is free to use, so you can run your own comparisons if you wish. My old broker sold all of the investment accounts to E*Trade, which went active November 5. All broker screen shots below are from E*Trade. 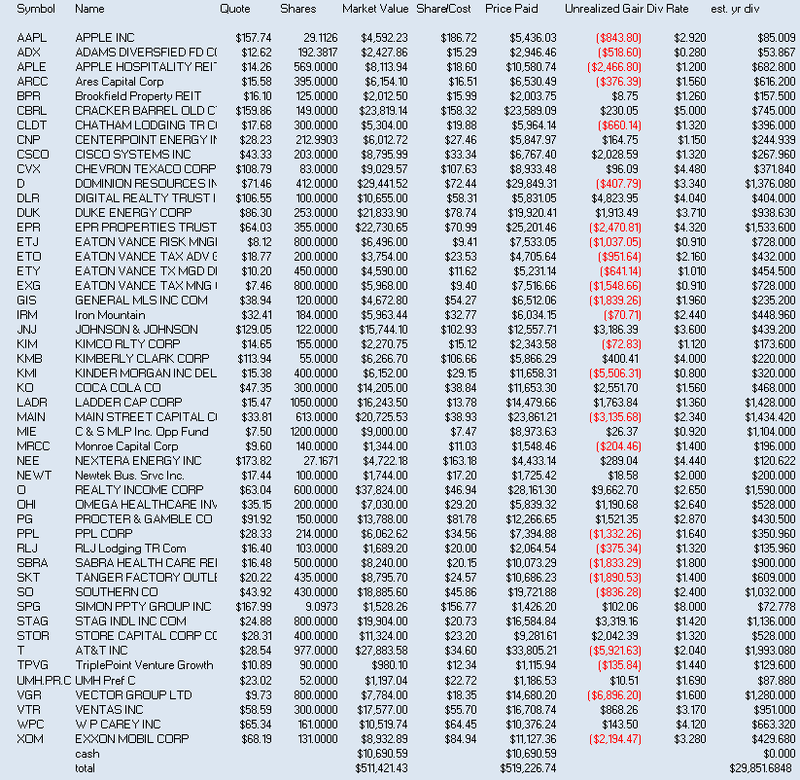 Below is a screen shot of the Excel worksheet where I track the holdings in my IRA Dividend Growth Portfolio. This is a real portfolio, not a model, and is part of my retirement savings. Since the last update at the beginning of the year I have been quite active. Having E*Trade as a broker has opened up some new possibilities for this portfolio, including the ability to write cash secured puts. I continued working with Rida Morwa and the High Dividend Opportunities SA Market Place service as a contributing author. Between research I have done for articles for the service and the contributions of others at the service I have found a number of opportunities I might not have seen before. 2018 was a good year for my portfolio. My primary goal is to increase my income each year by 12%. For 2018 that set my dividend income goal at $27,045. The actual total of dividends collected was $29,240.51, 21.088% higher than the $21,184.21 I collected in 2017. So far this year, the total return of the portfolio has been very good. The market value of the portfolio ended February at an all-time high of $568,488.20. I have also collected plenty of dividends. Above is a chart generated in Excel based on when I collected dividends over the last 3 years. Each year, I have around a 12% or better increase in dividends than the prior year. Each quarter I collected more dividends than the same quarter in the prior year. From time to time because of selling shares or changes in when companies pay dividends, as well as acquisitions and spin-offs, the dividend payments in a month will not be larger than the month in the prior year. This February was such a month. 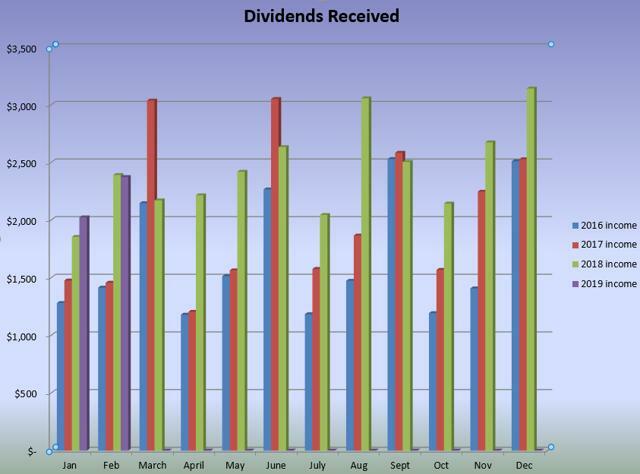 February last year saw a very big increase in dividends, so I am not concerned about the small (less than $50) decline. 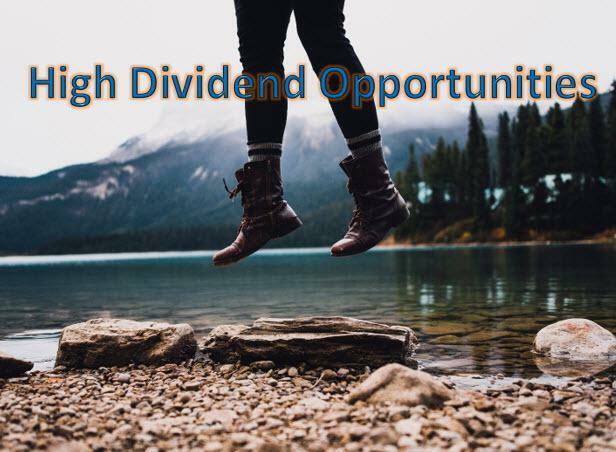 As long as the quarterly totals increase each year and no company has cut its dividend, I am not particularly concerned that a changing mix of dividend payments might make one or more months not pay more than the year prior. Next let’s look at the transactions I executed over the last 2 months and why I did them. So, I started off in January with almost $11K in cash. I used some of it on January 4 to buy 80 more shares of Realty Income (O) at a price of about $62.24. On January 16 I got myself a birthday present of 75 shares of Pattern Energy Group (PEGI) for around $19.83 a share. On the 18th I sold my holdings in STORE Capital (STOR) to get the cash to buy 575 more shares of PEGI. And finally I bought 100 shares of C&S MLP Opportunity Fund (MIE) on January 24 using cash on hand. I bought more shares of Realty Income because I had trimmed back my share count when the price was higher, and it looked like a good price to jump back in. I sold STOR because I had a pretty good gain in it and wanted to reduce my RETI concentration. I also needed cash to buy PEGI. I bought PEGI because it has had some pretty good growth and had a good well-covered dividend. I also wanted to expand my energy company holding to have more holdings outside of major oil companies. I bought MIE because I like the MLP sector but don’t want to deal with K-1s and potential for UBTI since my portfolio is in an IRA. February was a bit more active. In part this was due to a decision on my part that I wanted to get more preferred issues. Rida and I have decided that we think interest rate hikes by the Fed are about done and that in the not too distant future the rates will start to decrease. In part we think that in around 2 years or so the Fed is likely to be lowering rates in an attempt to prevent a recession. Given that I have decided to buy more preferred shares, and even in some cases swap common shares for preferred shares. So on February 1, I sold Ventas (VTR) to get the cash to buy 80 shares of Taubman Centers (TCO) Series K preferred. I trimmed back on Realty Income (I got $5 more than I paid for it) and Johnson & Johnson (JNJ) and sold my PPL Corp (PPL) position to get the cash to buy Medical Properties Trust (MPW). MPW had been on my watch list for a year and I just decided to buy it. PPL, while I had originally been quite bullish on it, hadn’t really been doing as well as I expected and I just needed a good place to put the cash in order to sell it. MPW fit that bill. I also bought an additional 50 shares of AT&T (T) at that time as well. I want more shares of T and am willing to buy it under $31 when I have extra cash. I ended up buying MPW in two tranches as the price dropped during the day and I looked for other funds to buy more at the better price. February 1 was a pretty busy day as 8 of the 19 stock transaction I did in February I did on that day. On February 5, I bought 40 shares of Gaslog Partners A Series Preferred. Gaslog is a shipping MLP that transports LNG. And even though it’s a partnership, it issues 1099s rather than K-1s. On February 11, I trimmed back 75 shares of STAG Industrials (STAG) and put the cash into 225 more shares of MIE. While I still like STAG, its dividend growth has been a bit slow of late, so I decided to reduce my exposure to it. On February 12 I sold my position in Monroe Capital (MRCC). I still like them, but I had a big run-up in price, which I thought would likely go away when the earnings announcement came out. Management hadn’t been as transparent as I would like in regard to one investment, Blackrock, that filed for bankruptcy protection and would be subject to more write-offs. I used the funds to buy more Ares Capital Corp (ARCC), a much more stable and reliable BDC. With a recession possibly coming in the next few years I wanted the more of the strong BDC. I still like MRCC, and it’s on my watch list, but I think the portfolio and its dividend income is safer for now with that cash in ARCC instead of MRCC. On February 19, I used cash on hand to buy 36 more shares of Iron Mountain (IRM). This was another REIT that was long on my watch list that I finally started buying recently. On February 25, I sold about half of my holding in Apple Hospitality (APLE) and Chatham Lodging (CLDT) and bought preferred shares from RLJ Lodging (RLJ.PRA) and Hersha (HT.PRC). Hotel REITs are the first to be hit in a recession, so I wanted to position these to lessen any impact and lock in some good yields on the preferreds. The preferred shares pay quarterly, but they do pay more than the common shares I sold. So making the switch increased my income and safety. Since neither CLDT or APLE had been increasing the dividend recently (or looked to do so anytime soon), I also most likely didn’t even give up any dividend growth. With the change to using E*Trade as my broker I finally got the ability to write cash secured puts in my largest account. This has increased the chances that a good option trade will be available to me. Contrary to what you might hear in some quarters, I don’t see options as a huge source of profits. Rather they are a good tool for managing risk and cash flow. I have a few very simple rules that I use when working with options. My first rule is to never write a contract unless I am willing to let the shares be exchanged at the strike price. That means when I write a call I am willing to sell my share for the strike price no matter what the market price is at the time. And when I write a put I am willing to buy the shares for the strike price, no matter what the market price is for the shares. I also do not write naked contracts, which means when I write a call I have the shares and when I write a put I have the cash (and not margin or something I can sell to get the cash) to buy the shares. Following these two simple rules you will take on no more risk writing contracts than you would buying and holding the shares. While I had 12 transactions involving options over the last 2 months, only 2 different companies were involved. Some drama over the last year or so has involved Windstream (WIN) and Uniti Group (UNIT). Windstream sold a bunch of its assets to Uniti and then leased them back. One of the bond issues that Windstream had issued had a covenant that appeared to prohibit such a transaction, and a major holder of that bond took Windstream to court claiming a default on the bond. To the surprise of many, Windstream lost. I took a bit of a gamble, with a very small amount of cash, that UNIT share prices would drop. I bought 6 put contracts on UNIT with an expiration date of March 15. As the owner of these contracts I was had the right to sell 600 UNIT shares at a price of $7.50 on or before March 15, 2019. I spent $158 to buy this right. As I didn’t actually own any shares of UNIT, in order to make money I need the price of UNIT to go down enough that I could sell the contracts at a profit. And sure enough I was able to sell my 6 call contracts on February 25 for $357.93 (after commissions). All the rest of my option activity over the last 2 months involved options on shares of T. With all the option transactions I netted ~$877. Last year I wrote 2 put contracts on T with a strike price of $28.50 and an expiration of January 18, 2019. On January 7, I rolled these out to February. What this means is that I bought the 2 put contracts I was short to close them, and then sold 2 new contracts with a later expiration date. In this case I did what was is called rolling out and up, in that the new contracts had an expiration one month later, in February, and also had a higher strike price at $29.50. This pair of transactions netted me $98. Previously I need to keep $5700 in cash in my account but I now needed to keep $5900 to cover me if these two put contracts were exercised. For the covered calls, I rolled 2 up and out to next January and wrote 4 more with the same expiration and strike price to get extra cash. 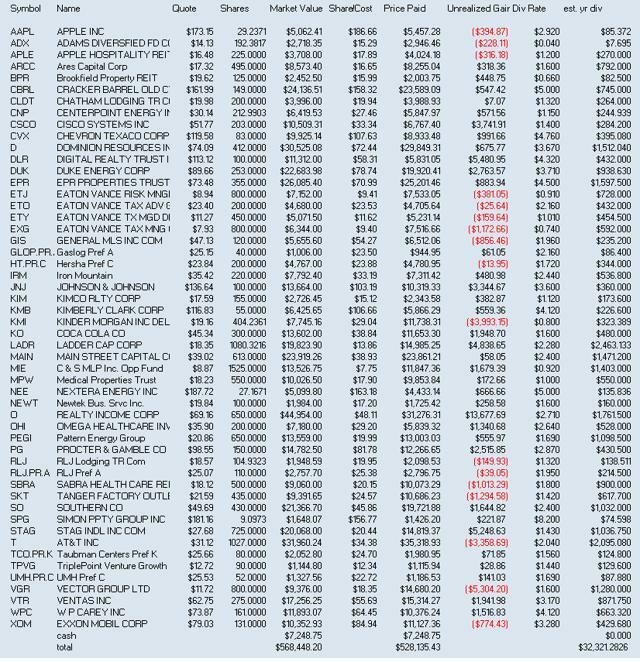 My current position in securities tied to AT&T is in the table below. For a while now when I present updates to my DGI Portfolio, a real portfolio owned by me and held in an IRA, I have also included data on what I call benchmark portfolios. The two benchmark portfolios each consist of 1 ETF and are models. I hold no shares of either ETF, but I consider the holdings and goals of each fund to be reasonable proxies for a dividend growth portfolio. 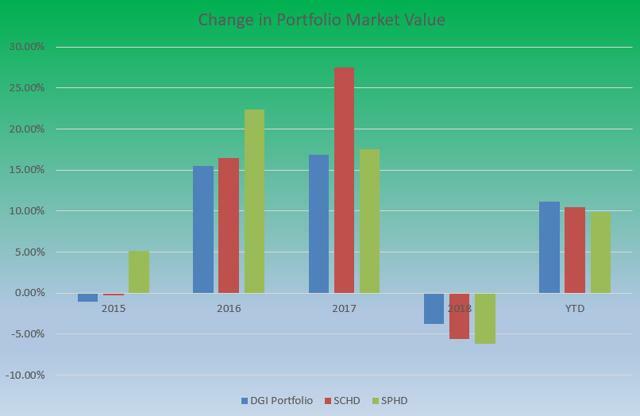 Using the Portfolio Visualizer tool, it wasn’t very hard to model two benchmark portfolios, one using the ETF SCHD (SCHD) and the other using the ETF (SPHD). My primary point of comparison centered around how the three portfolios meet my primary goals of income and income growth. I include information on the total return in the interests of transparency and because I have to scroll past those results to get to the income data from the Portfolio Analyzer tool. While total return is not a significant goal for me, lagging too far behind the benchmarks might indicate a stock selection problem. And while not important to my primary goals, I do make use of capital gains to increase my income when it makes sense from a portfolio and risk management perspective. Each month I total the dividend payments I have received during the month and put that value in my spreadsheet. I also pull data from the Portfolio Analyzer tool and add that to the spreadsheets that generate the graphs below. 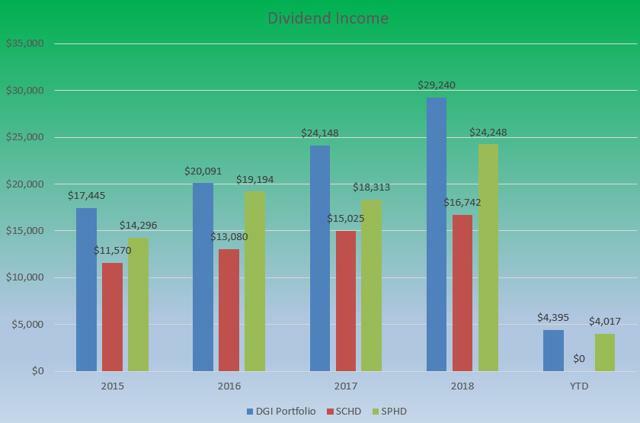 As can be seen in the graph above, my DGI portfolio as well as the 2 benchmark model portfolios increased the dividend income they produced in 2018. So far this year, I have collected payments for 2 months in my DGI portfolio. 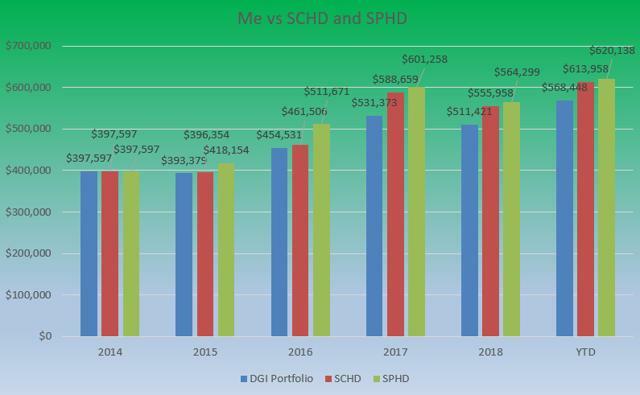 SPHD and SCHD pay quarterly, and while SPHD has made a dividend payment, SCHD has not yet made its first payment in 2019. I now have enough years of records to produce some additional graphs. Above is a graph showing the CAGR (Compound Annual Growth Rate) from 2015 to the listed date. To reach my income goal by the time I retire, I need a CAGR of 12%. All 3 portfolios have been growing income faster than that. My DGI portfolio has consistently done a better job of growing income that has the SCHD fund. SPHD has not been consistent in its income growth. From 2015 to 2018, its CAGR is higher than my DGI portfolio, but that is largely due to its growth in 2016, and in fact it actually had a decline in 2017. 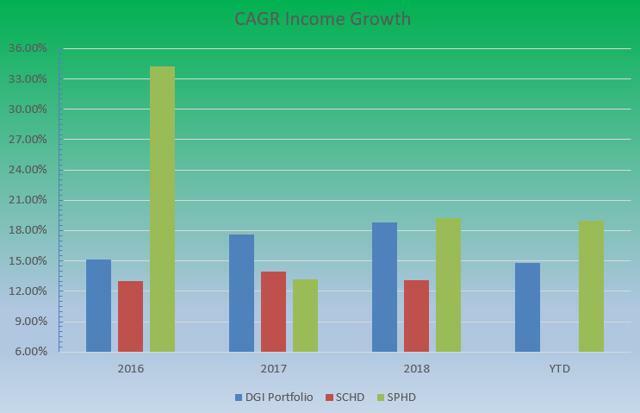 Currently on my DGI portfolio has a trend of increasing CAGR over time, which I think will help show that it is superior to the two benchmarks over time. Above are the latest portfolio values. All 3 portfolios have not only recovered from the losses of last year, but are up from where they started 2018 as well. Both of the benchmark funds continue to have higher market values than my DGI portfolio. Now that we have a few years to chart, I have added a new chart that shows percentage change in portfolio size. This chart helps us see that a large part of the bigger size of the benchmark portfolios in attributable to a single year’s performance (different years for each benchmark). 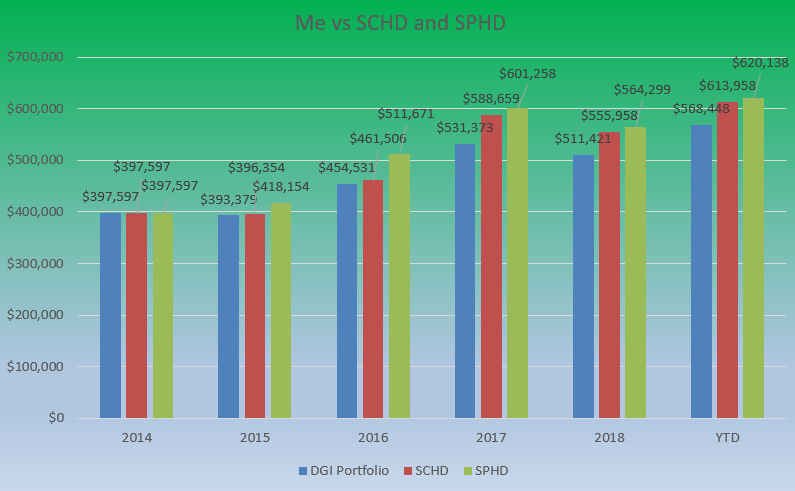 It can also be seen that in 2018 and so far this year, my DGI portfolio has been closing the gap with the benchmarks. So far I have collected more dividends in January and February than in the same period last year. However, being only about 4.5% above the YTD number from last year means I have some work to do to ensure that I meet my target income of $32,750 for the full year. My plans for 2019 continue to include buying more dividend paying shares at good value. Apple (AAPL) is down a lot and I might buy more of that. MAIN is phasing out its special dividends and folding those payments into its regular dividend, so I will buy more of when the price is right. I have also started expanding my holdings in other BDCs. ARCC holds a very similar portfolio to MAIN and trades close to its NAV (rather than the premium that MAIN trades at), so I will likely be adding even more shares later this year. I think interest rates are close to as high as they are going, so that will make preferred shares a good investment. I will be looking to add some more preferred issues to the portfolio to take advantage of that as well. I did already switch about half the assets I had invested in hotel REITS into preferred shares. I also joined the HDO team and will be using their resources as well. 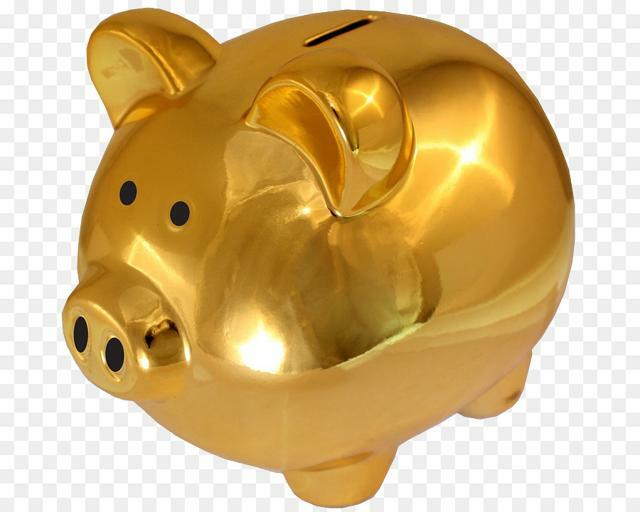 We are the largest community of income investors and retirees with over 2000 members. This is a Top-Rated service, ranked #1. We recently launched our "Preferred Stock & Bond" portfolio for conservative income investors. Take advantage of our 2-week free-trial to get instant access to our model portfolio targeting a 9-10% yield, our preferred stock portfolio, and income tracking tools. You also get access to our report entitled "Our Favorite Picks for 2019"
Disclaimer: This article is intended to provide information to interested parties. As I have no knowledge of individual investor circumstances, goals, and/or portfolio concentration or diversification, readers are expected to complete their own due diligence before purchasing any stocks mentioned or recommended. The price I call fair valued is not a prediction of future price but only the price at which I consider the stock to be of value for its dividends. 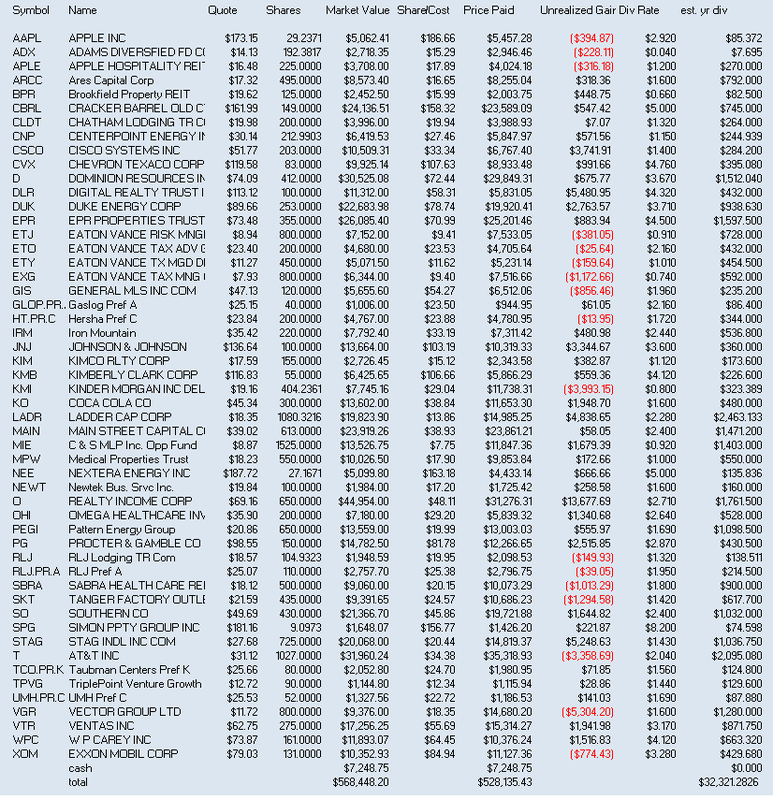 Disclosure: I am/we are long AAPL, APLE, ARCC, CLDT, IRM, JNJ, MIE, MPW, O, PEGI, STAG, T, VTR. I wrote this article myself, and it expresses my own opinions. I am not receiving compensation for it (other than from Seeking Alpha). I have no business relationship with any company whose stock is mentioned in this article. Additional disclosure: I am long all stocks listed in the DGI Portfolio whether I specifically mentioned them in the article text.